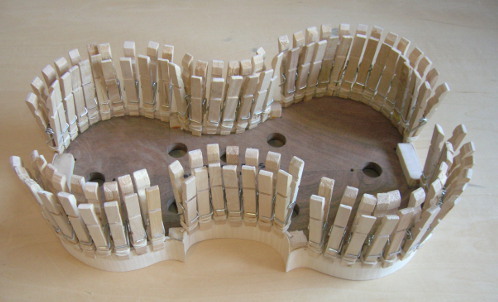 I have just glued the linings onto the ribs of a new violin. There are almost 60 clothespin clamps securing the linings onto the ribs. When it dries, I can smooth it with a hand plane and it will be ready to have the back glued onto it. This entry was posted in Violin Construction on June 1, 2015 by andrewkeim. Copyright 2019 © Andrew Keim All rights reserved.